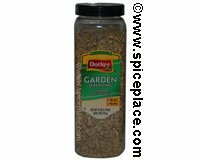 Salt Free Garden Seasoning is a delicious and colorful alternative to salt. Great in green salads, salad dressings, pasta dishes, potato salad, vegetables, dips and breads. As a guide, use 1 tbsp of Durkee Salt Free Garden per quart of soup, stew, and sauces, then add more (or less) to taste. Ingredients: Dehydrated Onion, Garlic, Spices, Dehydrated Carrots, Dehydrated Tomato, Orange Peel, Dehydrated Red Bell Pepper, Red Pepper, and Natural Flavor.